Honestly, there were some good moments and cheesy moments in this one. Wally has traveled through the desert and is now covered in cactus thorns. The setting is the Western U.S.A. Everyone has that cowboy (dumb country hick) schtick going on. People are calling him "Porcupine Man". 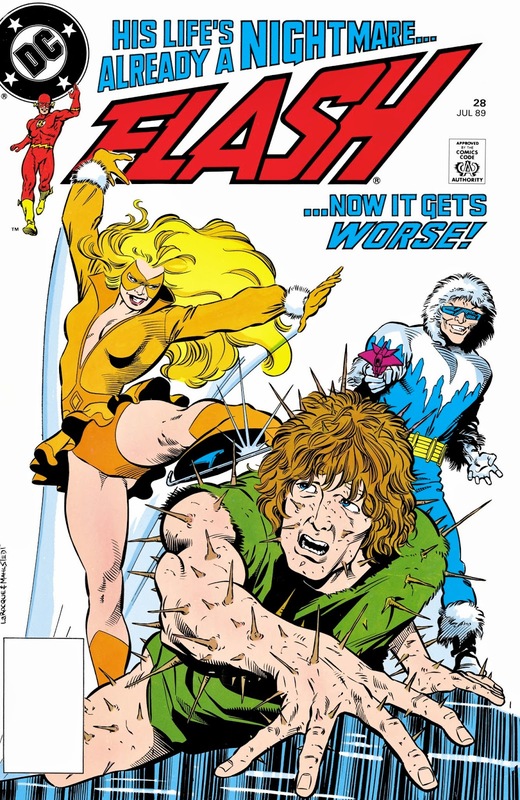 Villains Captain Cold and SandStorm have teamed up to form a 'retrieval company' called Golden SnowBall Recoveries. Their services were called upon by a small town sheriff whose son got trapped in a mine. Of course, as we've seen in the past several times, everyone's out to throw dirt on Wally West's (The Flash) name. Captain Cold has some chuckle-worthy moments in dialogue. But, for the most part, the whole story comes across as filler. There is no intriguing drama. This is troublesome for me because The Flash was revived by Mike Baron with a much more dramatic tone. The comedy in this issue is slapstick quality.